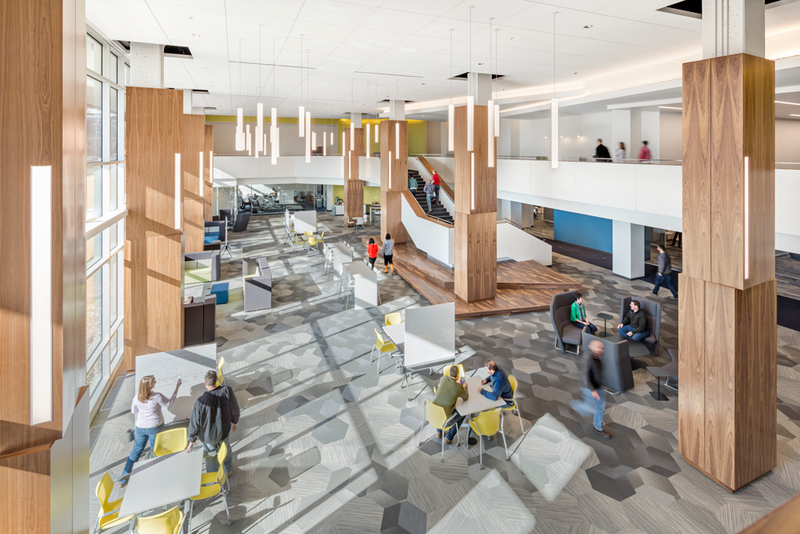 In establishing its new Northeast Headquarters, GE Healthcare Life Sciences had a clearly defined goal in mind: Consolidate operations, and, in the process, create better efficiencies and a strong collaborative culture. Chief among this operational strategy was the opportunity to function as a more agile research and development enterprise—an essential attribute of today’s leading life science companies. SMMA was first engaged to assist GE Healthcare Life Sciences in identifying an existing facility that both satisfied the client’s current needs and provided the flexibility necessary to accommodate future growth. The design team selected a multi-story building with ample amenities and infrastructure capable of supporting the client's numerous cGMP and laboratory environments. SMMA developed multiple options for lab and office configurations, as well as conceptual designs that enhanced a large, double-height space into an open forum for informal gatherings and meetings. One major concern that needed to be addressed early in the design process was the possibility of cross-contamination with an existing life science neighbor. Neither GE Healthcare Life Sciences nor its potential new neighbor wanted their proximity to one another to negatively impact their businesses. The design team conducted an analysis of process, HVAC, and electrical systems to verify that no contamination would result from the neighboring company’s processes, exhausts, services, or products. SMMA also developed a universal office plan that met the programmatic needs of the facility, working closely with GE Healthcare Life Sciences to understand departmental adjacencies, equipment and process requirements, and individual business-unit goals. We conducted a workshop with nearly 30 key stakeholders, all of whom were able to participate in shaping the vision of what the new facility would look like. By the workshop’s end, our design team had a diagram of the ideal relationships among the myriad business units being consolidated into the new location. GE’s new laboratories are state of the art, supporting scientists and researchers who work within one of the world’s most competitive industries. Lab types are both wet and dry, and are utilized for research and development; bio-processing in upstream, downstream, and single-use development; chromatography, at both lab scale and process scale; cell therapy; diagnostic development; and process analytics. High bay labs, training labs and scientific support labs can be found throughout the space. Advancing GE’s products and services meant creating a design that prioritized flexible and adaptable infrastructure of utilities and laboratory casework. The result is a facility with spaces that will support GE Healthcare’s products and services for years to come. Customers are often brought to the facility to be trained on new equipment, and to partner with GE Healthcare Life Sciences in the development of new products. Maintaining the business’s privacy and confidentiality when these visitors tour the lab space was of paramount importance in our design strategy. SMMA designed a tour route throughout the facility that enables visitors (and employees) to see manufacturing processes and provides a view into non-secure laboratories, without compromising another customer's business interests. Educational and marketing materials are located along the tour route in the forms of electronic and traditional media. Strategically placing break areas between the office and laboratory spaces encourages interaction and transparency among departments, while also promoting creativity and innovation. SMMA incorporated interior finishes that reflect the client’s culture and connection to nature, with interior glazing reflecting the transparency of the business and maximizing daylight views. Employees are able to plug their laptops in and connect wirelessly throughout the facility and can choose from a variety of seating options that accommodate various work styles and meeting types. The GE Healthcare Life Sciences project is occurring at the site of another SMMA project, Marlborough Hills. Click the link below to learn more.